An authentic medieval castle standing proudly amid its XI century ramparts is the setting for this charming establishment. Originally owned by Robert Bertrand who fought with William the Conquorer in the Battle of Hastings it offers a dining room in the Knights' Hall and old world charm in comfortable guest rooms. Visited by Queen Victoria in 1857 and Field Marshall Montgomery in 1957. The marvellous framework of an authentic medieval castle surrounded of its ramparts. 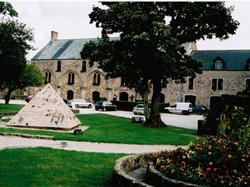 In the heart of the peninsula of Cotentin: many sites to be visited, pedestrian paths and walks with horse in the neighbourhoods. Dining room in the room of the knights with its XII 2nd century old pillars. Certain Ansleck, great nephew of Rollon, first "duke" of Normandy, would have raised the primitive feudal mound on which draws up the current fortress of XIVe century. Its keep of 22 meters and 3 stages represents, with its 11 sides the ultimate evolution of the square tower towards the round tower. The ring a flanked enclosure of eight turns which the contemporary life seized without disfiguring it. A staff waiting room, become dining room hotel, thus presents a double line of summoned pillars of carved capitals. A crypt of XIIIème century, refitted, became place of exposures. Testimonys of the continued life of a strong rural borough, also sits of a large abbey.